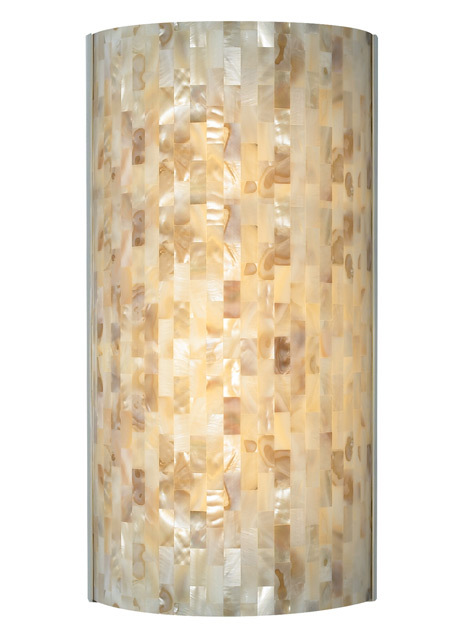 This artisan-inspired elegant Playa Wall Sconce by Tech Lighting features a half-cylinder shade designed with natural shells for a unique look. Rolled edges are set along a minimal metal base. Generously sized at 14” tall and offered in two fabric colors, Desert Clay and White, both with Satin Nickel hardware. Available with and without lamp. Mounts vertically only. Rated for (1) 75w max, E26 medium based lamp (Not Included). LED version includes 16 watt, 1000 lumen, 2700K LED modules. LED version dimmable with low-voltage electronic dimmer. ADA compliant.